Affluent investors enter retirement with numerous methods to pay for the big-ticket items that come along such as medical expenses, travel and education for the family’s next generation. They also have numerous income streams that help them pay for their monthly expenses in order to maintain their balances in their long-term holdings. One of the income streams virtually all affluent investors take advantage of is the federal Social Security program, which offers benefits investors earned through deductions during their time in the work force. Although they access their Social Security benefits at different ages, retirees often use those benefits to handle a significant portion of their monthly expenses in retirement. The surprising element of the relationship between retirees and Social Security benefits is the seeming lack of time spent considering the options that exist within the Social Security program. Likewise, it is surprising the low percentage of retirees who accessed information from their financial advisors in making the decisions about when to start receiving Social Security benefits. The decision to start taking Social Security benefits can be affected by age, marital status, health, family matters as well as financial status. Advisors well-versed in the extent of Social Security benefits as well as the financial background of an investor can assist in the decision. But they are rarely asked to help. Social Security allows Americans who paid taxes as employees to fund the program to access those funds again in retirement. The money is paid out in monthly disbursements and determined by the number of years a person worked and the amount the put into the system. There is a full retirement age of 66 or 67 depending on what year the investor was born, but benefits will be cut if investors take benefits before their full retirement age. Likewise, benefits will rise for every year an investor does not take his benefits. The role Social Security plays in the decision to retire depends entirely on the circumstances surrounding the retiree. But few investors make the decision to retire based on reaching their full retirement age according to the Social Security benefits calculation. 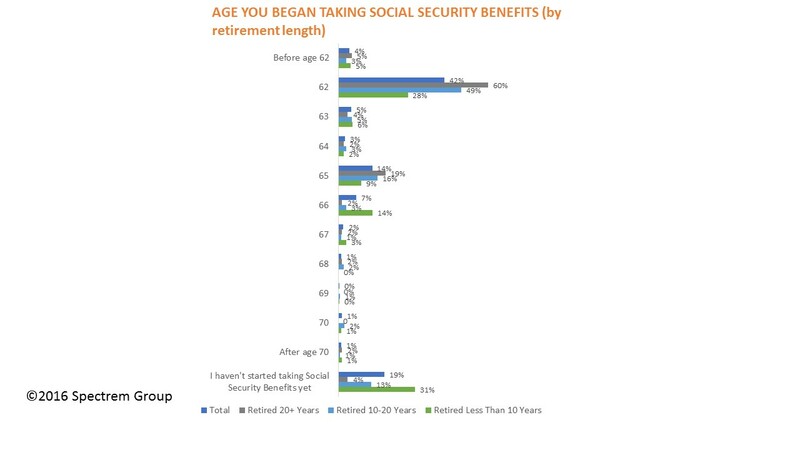 Spectrem’s extensive research study into the considerations and habits of retirees, Financial Wellness in Retirement, asked retirees what affect Social Security benefits has or had on their retirement decisions and financial situation. The study surveyed retirees with less than 10 years in retirement, 10-20 years in and 20-plus years in retirement. Only 4 percent of retirees retired because they reached their full retirement age based on Social Security calculations. It was far more likely they retired when they reached a certain level of assets, reached a particular age that they predetermined would be their retirement point, or due to events beyond their control, such as the loss of a job or the death of a loved one. For a variety of reasons, 40 percent of investors began taking Social Security benefits at age 62, the earliest one can take benefits unless there have health issues that affect their ability to work. Other than that, 14 percent of investors took retirement at age 65, which was full retirement age until 1983, when it was bumped to 66 or 67 depending on an investor’s birth year. But the most revealing fact from the study relating to Social Security benefits is that only 26 percent of retirees spoke to their financial advisor about the best time to take Social Security benefits. Only 13 percent of retirees with more than 20 years in retirement did so, while 38 percent of the most recent retirees took advantage of the opportunity. A majority of retirees did the personal study to determine the best time to take benefits. More than 40 percent also accessed the Social Security website, which is very detailed in its explanations. But investors can make mistakes in regard to benefits, and advisors can help investors make proper decisions to maximize their benefits. This is especially true for married investors when both spouses have Social Security benefits to access. Advisors can also help determine how much a retiree is going to depend on Social Security benefits for monthly income purposes. Investors approaching retirement may not know that their financial advisor can provide guidance related to accepting Social Security benefits. They need to know advisors can help determine the best time to take benefits based on an investor’s assets, retirement income streams, age, marital status and health. Make Social Security benefits a regular topic in retirement conversations. They can greatly affect how other income streams are handled in retirement. Many retirees wait to begin taking Social Security benefits, and many have done their own research to determine the best age to begin accessing those funds. But are they correct in their assessment? Ask them how they came up with their anticipated age to take benefits. It may seem wise to wait as long as possible to increase the monthly check that comes, but other factors can affect that decision.